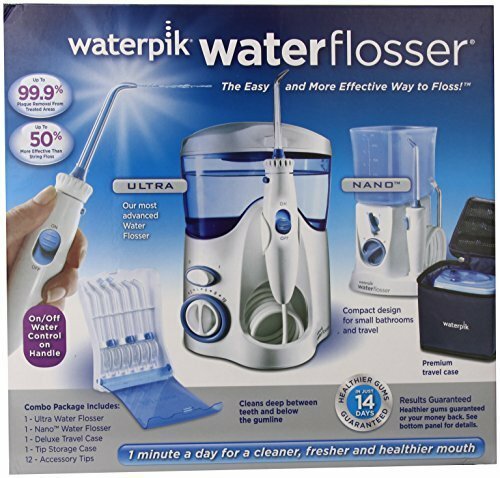 Top 9 Best Water Flossers Reviews 2019 | Cordless & Counter-Top Waterpiks For Perfect Teeth! Does traditional flossing cause pain or bleeding? Have stubborn and excessive plague, or bad breath? Or you just want something 10x better than a traditional toothbrush? If you answered yes to at least one of the questions above, then this water flosser review is FOR YOU! We reviewed more below, but only highlight the top 3 here. We've reviewed other flossers which you can read about below, but only highlight our top 3 picks. The WP-600 Aquarius Professional has been made with “human” in mind. It is not only effective at what it does but also highly convenient and easy to use, no wonder consumers around the Internet gave it an average rating of 4.5/5. The magic of this Water pik flosser comes from its compact and modern design. This Water flosser spots an On/Off water switch, an easy to reach the button for pressure control and push-button power with LED display, all that on its handle! It is the only oral irrigator that packs that kind of functionality in this water flosser review. It’s really made for humans, isn’t it? Hydro-pulse massage Mode – ideal for enhanced gum stimulation and improved circulation. Floss Mode – a pulsation technology that provides maximum plaque removal. • Toothbrush tip – Also for general use. • Orthodontic tip – Ideal for braces. • Pik Pocket Tip – For periodontal pockets and furcation. The Aquarius Professional WP-660 Waterpik flosser is small enough to fit in the tiniest bathrooms without claiming too much space on a counter. Its compact design makes it 2x lighter than most water flossers reviewed in this article, off-which it also negatively raises a question about its durability and quality in some people. But Water pick (the manufacturer) dismissed this perception by saying, ” Water pick’s design of this model includes a new High Voltage DC motor which reduces power consumption by 56%, increases performance by 10% and is more sustainable for the environment”. Unfortunately, the WP-600 Aquarius flosser seems to produce more noise than its size, so it might be an irritation for sleeping people if the bathroom is near the bedrooms. If you’ve owned (or own) a previous version of the Waterpick flosser such as the Water Flosser ultra, you will appreciate the looks but may not like its functionality. But if it’s your first time owning a Water pik, you will love it! See our full review of the Aquarius waterpik here. Waterpik’s latest and great Cordless Advanced Water Flosser is sublime – we couldn’t recommend it more. One thing that makes it great is the 3 speeds – slow, medium, and high that will really help you effectively clean. It comes with multiple piks and brushes, and has a long battery life – you only need to charge it once per week. However, after it is done charging (about 2 hours) make sure to UNPLUG it. If you don’t unplug it, the battery will die which is a huge con. Another con is that the water reservoir is pretty small. At the fastest speed (uses the most water) it’ll empty out the reservoir in about 50 seconds. That may be enough time, but for some people (if you’re extra thorough or have braces) then you’ll probably need to re-fill to complete your cleaning session. If you adore and care for your child’s dental health, you’ll fall in love with this waterpik for kids. It is idyllic for kids with dental issues such as gingivitis, cavity and somewhat sore mouth – perfect for your toddler that’s wearing braces. It is clinically proven to be 5x more effective than brushing and for cleaning around braces! Since it is a waterpik for kids, it is very light in weight plus extra safety precautions have been taken – it has a kid-proof electrical design. The water reservoir can be used as a cover to keep dirt from a distance. Because it’s designed for kids, it’s got to be very easy to use. 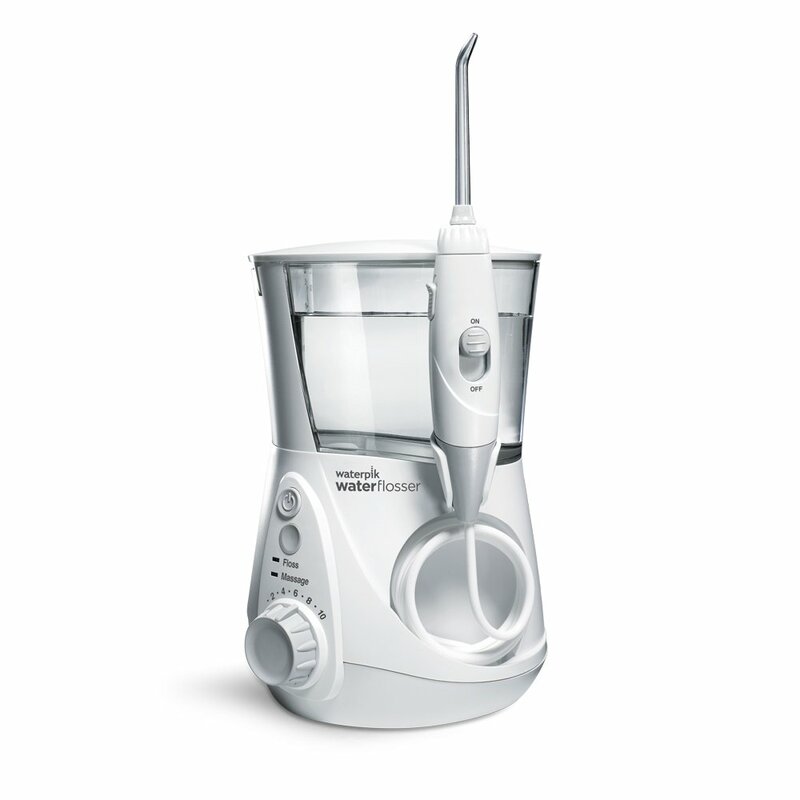 Just like the Waterpik WP-660 Aquarius Professional Water Flosser above, the frequently used button such as the pressure control system is at finger-tip’s reach. Honestly, it would have been more convenient for children if the On/Of button or was also fitted on the handle. • Classic Jet Tip – For general cleaning. • Orthodontic Tip – Which makes it one of the best water flossers for braces. To make it even extra eye candy to the child, 20 removable cling decals are included for your kid to personalize the device. One set of the sticker (decals) is more of girls theme, while another is more boyish. Astonishingly, this supposedly for “kids’ waterflosser” has something special that adults living out of America have been longing for – a dual voltage unit! That means, this unit supports 110v – 220v with 50Hz/60Hz. Some adults have reportedly used this device successfully, despite the “kids” aspect of the model. So if you’re one of the “unfortunate” that lives abroad, then you might consider getting yourself the waterpik Water Flosser for kids to get a gist of a water flosser. Flossing and brushing has never been this fun, easier and thoroughly for kids, every kid will fall in love with brushing teeth again. Just make sure to guide and teach your kid step by step, otherwise you’ll have to clean up after her all the spilt water. The only significant drawback is an On/Off button being on the device itself and not on the wand/handle as I have stated above. This makes it easy for kids to spray water all over the place while they try to turn the device Off. Waterpik should have really thought about this, as it has spoiled an almost perfect invention. Not forgetting the noisy sound it makes, it might scare off younger children at first. Regardless, this Waterpik for kids made more than 500 parents around the web (and their kids) happy, there’s no reason it won’t do the same for you and your kids! 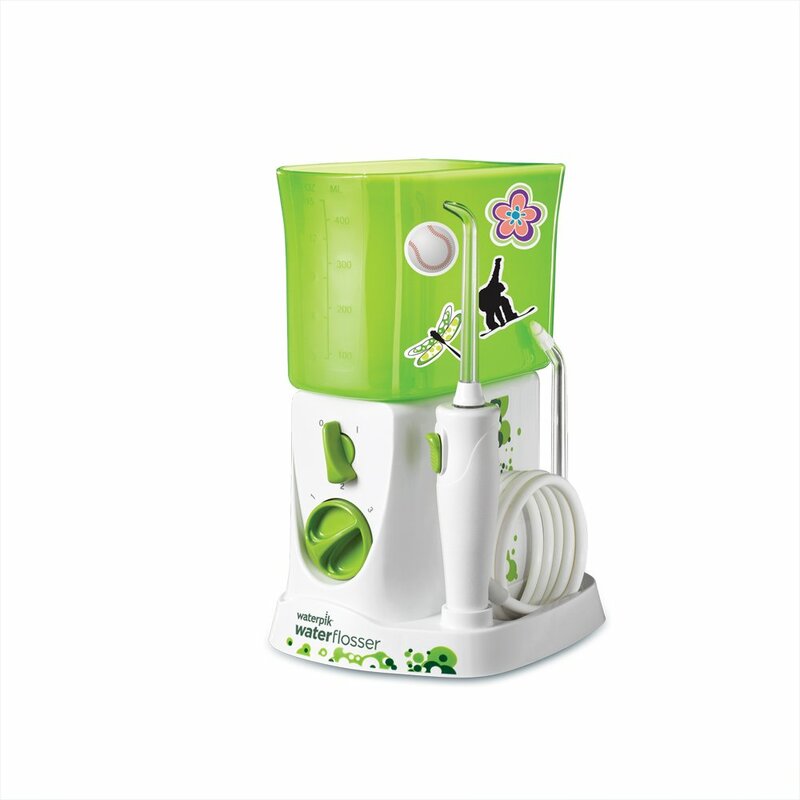 Go get the Waterpik waterflosser WP-260 for kids now! That’s three down and two more to go! Still wondering what is the best water flosser? I hope we are achieving our goal for providing the best water flosser reviews. Let’s get down to #4! Read the Waterpik for kids full review. Not enough tips for this kids oral irrigator? Then check out more than 11 Waterpik replacement tips here. This product packs 2 in 1, the Water pik Waterflosser Ultra and the Waterpik Traveler Flosser. That’s power and freedom for one low price! The Waterpik Ultra can be a replacement for both your Sonicare Air Floss and traditional string floss (if you have braces). It is clinically proven to be 90% and 50% effective compared to Sonicare Air Floss and traditional string floss respectively. Among 11 other tips, the Orthodontic tip is included in the pack – ideal for cleaning around braces. 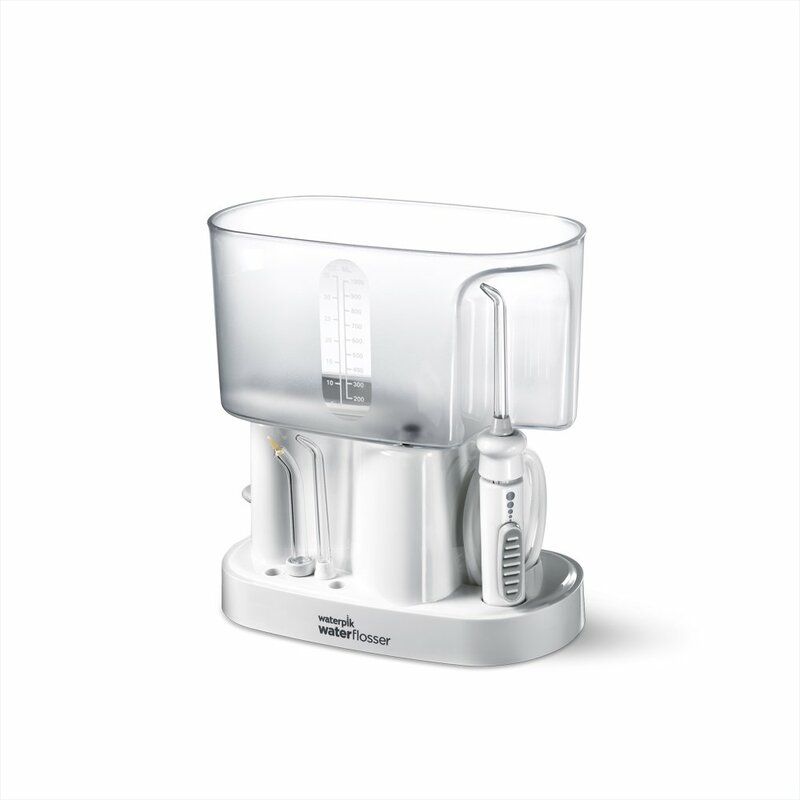 The WaterFlosser Ultra and Waterpick Traveler flosser will be your best oral irrigator of choice if you have two bathrooms or a large family as it packs 12 accessory tips. If one member of the family had to leave, he’d take the deluxe travel bag (included in the pack) and slid in the compact Traveler flosser leaving behind the Ultra flosser for others. The only notable disadvantage of this product is its advantage – the Traveler waterpick. It is only 110 volts compatible and cannot be used with a transformer as it is required 60Hz, so it can only be used around North America. Pity you can’t travel too far with the “traveler”. Apart from that, the WaterFlosser Ultra and Waterpik Traveler flosser will be a great addition in your family’s oral health arsenal! Even though the Ultra Water Flosser is rated slightly less than the water flosser reviewed on #1, it has got to be the best oral irrigator on the market in 2016! With almost 10K water flosser reviews around the web and it still managed an average of 4.4/5 and that alone is impressive! It may not be as feature rich, fancy and attractive as its successor (the WP-600 Aquarius Professional), but it does get the required job done and more. Clinical studies proves that when used regularly, the Ultra Water Flosser gives you healthier gums in just 14 days. The reservoir’s capacity is big enough, if it’s filled completely and the pressure set to mid-range it will operate for 2 minutes 45 seconds before it needs another re-fill. The wand itself spots a nifty button that lets you temporarily pause the water flow, avoiding the “messy” complaints raised with the Water flosser for kids reviewed above. The tip can easily be rotated while it is in use, which lets you conveniently position the tip in your desired position while it’s in your mouth. It also comes with 8 tips – 3 standard jets, 4 tongue cleaner, 1 “pik pocket” for thorough gum purging and an orthodontic tip – which makes it fall under the category of best water flosser for braces. It is quite big compared to the WP-600 Aquarius and the kids’ model, but it still won’t clog your counter top. The handle could have done with a few inches longer hose so the user does not have to put it too close or on top of the sink when using it. There are some people who raised concerns about it being on the loud side, but I’m just not sure if they were expecting complete silence? However, these minor flaws are insignificant considering the results this unit can achieve. A handful of users have reported to use it for more than 3 years without leaks and strange noises and it’s still going strong! This unit may not have all the bells and whistle that are seen on most modern oral irrigators, but it does get the job done as expected! Just because it’s labelled ‘classic’, that does not mean it does not have a few contemporary features. The six-setting buttons are conveniently built-in on the handle, which lets a user seamlessly move from gentle-to-deep cleansing without hustle. Its tip does rotate at 360 degrees for easy access to all parts of the mouth. Apart from its specious reservoir which reduces the need to refill before you finish flossing, it also comes with an extra small speciality reservoir that is designed for use with your favourite mouth wash. Unlike other “adult” oral irrigators that packs 6 or more tips, the Classic professional Water Flosser comes with only three, this might turn off some people but it’s still not a deal breaker! • 2 Classic Jet Tips – For general cleaning. • 1 Pik Pocket Tip – For gentle, low-pressure delivery of antimicrobial rinses. It’s unfortunate that the Orthodontic tip is not included, meaning, this classic water flosser will not be recommended as one of the best water flossers for braces. If you have braces, look at other available options. One more thing that might irritate some souls is that the water reservoir does not have a lid, but maybe that’s because you can flip it over and cover the unit after use. And a handful of reviewers mentioned its loud noise, I’m not surprise though, given the classic aspect of the model. If you don’t care about beauty and modern features of a water flosser, and you seek a chilling, powerful, pulsating stream of water inside your mouth, then the Waterpik Classic Professional Water Flosser WP-70 maybe the right unit for you! What’s not to like about the ToiletTree Products Oral Irrigator By Poseidon. that’s perfect for both home use and travel. It’s extremely convenient since it’s cordless and the batteries last a long time (about 2 weeks) – in fact it’s rechargeable and doesn’t require any wires or cables. You simply place it on the charging pad and it’ll start charging. 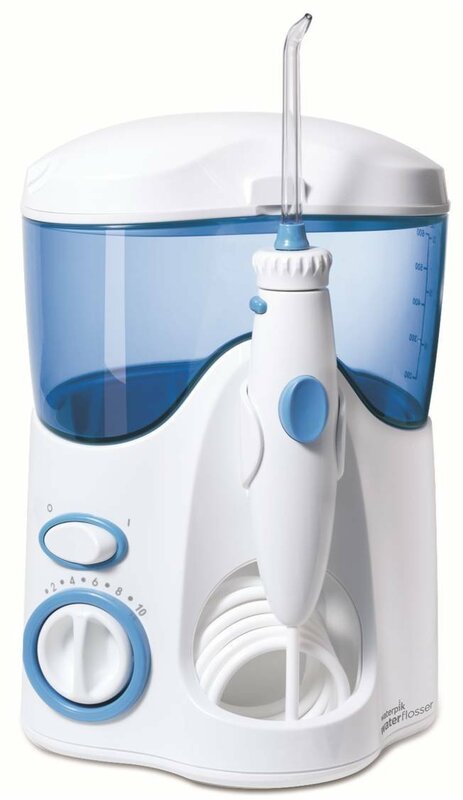 This oral irrigator has 3 modes to help you clean your teeth, and all of them are very gentle on your teeth and gums, perfect at preventing gingivitis and removing plaque. The water reservoir is decent, but not great – you’ll probably have to refill once or twice in order to get through your all your teeth. When it has less than half water you need to keep the toilet tree irrigator up right or the pick up tube will mostly be sucking air. It can be a little tricky to get used to this, but once you do it’s easy enough. Alternatively you can just refill it more often, but this takes more time. The flow rate and pressure may not be as good as a countertop water flosser, but you can’t expect the same power for something so small that is meant to be more convenient to bring around than a countertop option. It still does a fine job and should get any stuck pieces pretty easily. The Ellesye knows how to deliver! Despite being a new brand to the space many people enjoy this alternative to Waterpik, saying it’s great for teeth and gums with the pressure, but sometimes it’s not powerful enough. Ordering from Ellesye will give you the irrigator and some extra tips, perfect to get that clean-teeth feel. It’s very affordable compared to Waterpik, but keep in mind their support isn’t as good. While it does a good job, it’s not any better than Waterpik’s products. It’s a little cheaper, but we think it’s worth the extra $10 for the extra pressure has and the AWESOME support that waterpik has. They are great at troubleshooting and are extremely responsive. #1 FOR THE MONEY. Relatively new to the space, H20Floss provides a good flosser that is very affordable. You won’t get some of the extra features that waterpik flossers come with, but it does its job and it does it well for a cheap cost. We don’t recommend this for travel as it is larger and bulkier than our recommended WaterPik, but at least is is a little quieter than the competition. One thing I liked about them is their support. Mine stopped working after 2 weeks, but I contacted support and they shipped me a new one once I talked to them. It was easy and hassle free. I know of other people who have had issues with their units and even the tips – regardless, H20 send replacements without any issue and everything was good again. Despite the low cost, things are pretty comparable. Pressure seems to be about the same as leading brands (a little less) and the construction of the units are solid as well – it doesn’t seem cheap and after 4 months it has been solid! It has a larger tank then Waterpik’s Ultra WP-100 and feels more heavy duty (in case you’ve used that one for comparison). Some people who aren’t a huge fan of Waterpiks enjoy using this instead, so if you’ve tried Waterpik and are looking for an alternative, check out this low cost alternative with solid support. We have reached the end of the best water flossers of 2014. Hopefully this review did not leave you with more question such as “what is the best water flosser?”. I also hope we have served our purpose by giving you the best water flosser reviews.